Actually, that would probably be a horrible idea right now! I have some weirdo flu-like symptoms going on - minus out my least favourite one.. So, it really isn't that bad. I am lying though. I feel like I was hit by a bus. Every joint hurts, my knees buckle as I walk from point A (the couch) to point B (the bed) - I have extreme headaches and when I turn to look sideways - awesome shooting pain! Bleh. I just figured I would make this post quickly, then head back to bed!! I saw this look on SuPa Nails and really liked it. I just changed up the colours a bit.. Well, I used green instead of yellow and grey instead of purple.. Anyways! Polishes used are: Orly Mirror Mirror, OPI What's With The Cattitude?, Color Club Twiggie, OPI Lucky Lucky Lavender. 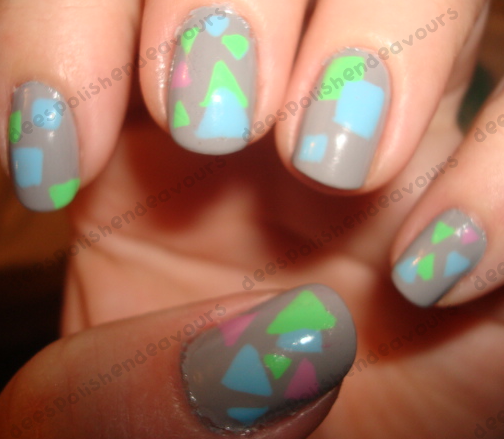 Next time, I think I want to partake in this accent nailage posted by MeganChair - check them out! So pretty!! AND! I need to get my mitts on the CG Christmas collection.. Especially Party Hearty! It steals my heart. Alrighty, I am off to bed! I hope everyone is fairing better out there than I!! KarenD - You really should! They are fun and easy AND can really add some extra fun to any mani you're sporting!! Aurora's Nails - Thankies! I wish I could take creative development on it - but I agree, the colours look amazing together!! oh no! hope you ge better.. but i love this mani! I hope you feel better and you're getting the flu! don't forget to get your flue shot! I keep forgetting about supa nails. need to check out the website more. what do you use to paint your nails? a tiny brush? I don't think you use the brush provided with the polish cus you can't get that much detail...can you? This looks awesome! I hope you feel better soon. The opening sentence made my start singing "Let's get Physical!" Very cute mani, and the colors look great together!